For Two Thousand Years (translated by Philip Ó Ceallaigh, review copy courtesy of Penguin Classics) is a 1934 work by Romanian writer Mihail Sebastian. The first half of the book looks at a year in his life as a student in Bucharest. A melancholy soul, he’s constantly anguished by both his Jewish background and the anti-semitic violence plaguing the university, using his diary to note down his thoughts on the internal and external turmoil. Sebastian is a writer I’d never heard of, with For Two Thousand Years being his only novel (having escaped the Holocaust, he was unfortunately killed in an accident shortly after the war). An eastern European Jew, the writer works through his thoughts about his heritage in his novel, with his protagonist wrestling with an identity he doesn’t entirely accept. However, the novel is also a wider look at the forces controlling Romanian society during the Interwar period. The whole thing bores me to death. I’d like a big, clear, severe book with ideas that challenge all I believe in, a book I could devour with the same intense passion with which I first read Descartes. Every chapter would be a personal struggle. But no: I’m involved in a ‘matter of principle’. Ridiculous. Unfortunately, it’s not that easy. He may just want to learn, but the fights in the lecture theatres and the punches aimed at any Jew foolish enough to sneak in make it a difficult task. I would criticize anti-semitism above all, were it to permit me to judge it, for its lack of imagination: ‘freemasonry, usury, ritual killing’. Is that all? How paltry! The most basic Jewish conscience, the most commonplace Jewish intelligence, will find within itself much graver sins, an immeasurably deeper darker, incomparably more shattering catastrophes. This early part of the book, the fragmented outpourings of a tortured young man, has echoes of several classic characters (Stephen Dedalus as a Jew, Malte Laurids Brigge exiled in Bucharest, young Werner with a little more sense and a little less drama…), and everything is symbolic, and often larger than life. Good examples of this include the narrator’s chance encounter with Abraham Sulitzer, a salesman of Yiddish literature and scripture (a true wandering Jew), and the fiery discussions with the Zionist Sami Winkler and the Marxist S.T. Heim (a combination which brings to mind The Magic Mountain, with the narrator as Hans Castorp caught between Settembrini and Naphta). I am looking forward to this one, but it’s a little way down the pile. I discovered there is another one of Sebastian’s novels that was translated here in Canada and released by Biblioasis. I’m curious about that too, I have quite liked some of the Romanian lit I’ve read. I’ve seen Blinding in the store, it sounds great. I have a few Romanian titles on my shelves but the last I read was Max Blecher’s Adventures in Immediate Irreality, it’s quite surreal – Blecher was diagnosed with spinal TB and spent most of his short adult life in a plaster body cast. He died in 1938 at the age of 28 but wrote two novels and a number of esays propped up in bed! The Sebastian title I’m referring to is The Accident, the first translation (2011) of his fiction apparently. Oh, lucky, lucky you! I’ve been dying to read this one, given my Romanian background, and this wasn’t available in Romania at the time… Maybe I should try to get hold of it in Romanian and compare the two. But you are wrong about him only having written one novel. He wrote quite a few (as well as plays): The Accident, The City with the Acacia Trees’, ‘The Women’ and others. I loved them when I was a teenager, as they felt much more modern and Western than most Romanian novels of the period. I have this sitting on the TBR and I’m very excited about it – glad to hear it’s so good! I’ve been keeping an eye on what Penguin Classics are bringing out so I first heard about this last year. John Self was also tweeting about it. Hopefully I’ll get round to it after the Man Booker International reading is over! Grant – I really should pay more attention to their list. To be honest, I’m usually up to date with what the indies are doing, but I have no idea about the majors (which I blame on their lack of publicity for translations – and their unmanageable websites!). 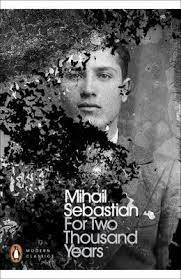 Mihail Sebastian’s diary is one of the most compelling of 30s/ WW2 narratives. Available in translation.